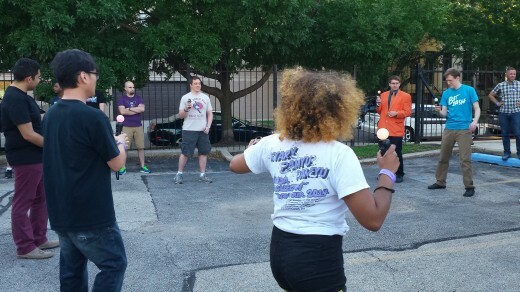 Adults play Johann Sebastian Joust outdoors at BitBash Chicago. The last three weeks have utterly destroyed me. Granted, I’m not someone who had a hate campaign targeted at me, but watching women I considered to be at the forefront of games criticism being picked off, harassed, doxxed or quitting really took a number on my own sense of safety as well as my desire to be a writer in gaming. This slow-moving avalanche of misogyny reminded me of some awful things in my past and left me struggling to articulate feelings of helplessness as a woman, feminist and creative person. We met up on Saturday and took a car over to the Threadless warehouse space in the Western Loop area of Chicago, not knowing what to really expect. We showed up and were greeted by a pretty welcoming sight: people milling around in the front parking lot playing games and having a good time. We had gotten there early enough so the food trucks hadn’t quite been set up yet, but late enough to make clear that the space was full of things to do and see. We had pushed our arrival later in general, as BitBash had warned of lines, but for the most part it was just the right amount of people and we had no problem getting in and milling around. One of the first games I got to experience was Johann Sebastian Joust (Die Gute Fabrik), which Gita had excitedly mentioned wanting to play since we got there. When I had read the description, I was confused, having no experience with the original game, and it seemed very abstract. Watching a bunch of people play it though, made me realize how fun it was. Even though I didn’t step in (I have a really intense performance anxiety), watching everyone flail around and move to get other people to shake their controller, appropriately controlling their speed to the slowed-down or sped up orchestrations, was incredibly entertaining. Adults playing and having a good time outside is infectious and isn’t something you see often, especially since many of us focus on hobbies that keep us inside, aloof. Not to be outdone by just peers, I even saw a group of grown men attempt to compete with a tiny little girl who was just as excited as them to play. That kind of experience was indicative of what I noticed over and over again while we were there: everyone showed up. Gaming events have always felt very overwhelmingly white and male and this didn’t. Granted, there still were a lot of white dudes there, but many more people were that didn’t fit the profile. A highlight of this was notably how many women there were. Given recent events, it made the event feel incredibly safe. Looking around, I saw tons of women: working the event, playing video games, as well as sitting around chatting with each other. In general, it was a diverse array of nerdy people with splashy t-shirts with Metal Gear Solid or Doctor Who, hipsters with knit caps and flannel, as well as people who I’d probably see in my office. It wasn’t even the typical young, single crowd either. There were older people, parents with kids, and couples of all varieties. It surprised me, even as someone who’s crowed that “gaming is for everyone.” Seeing it happen as a bunch of people coming out to have a fun time really knocked that idea home for me. Other than attendees, Threadless itself was another high point. The space was incredibly inviting for not just play but also relaxation, which I relished. I’m someone with a chronic illness and having half of it outside with benches and grass meant that I could take breaks to sit down, read my phone or generally enjoy the nice weather. Gaming tends to present a level of stimulus for me but adding in crowds of people (and it did get crowded inside at times) meant that it becomes a touch overwhelming, so being able to take a moment was appreciated. If I had to grouse about anything, it’s only that it needs a bigger space next time. Lines for the food trucks also presented a problem, as standing for long periods of time on concrete made comfort impossible. Overall, though, it felt nice that there were spaces to chill out and socialize if you needed a break. Gaming could do well to recognize this for other events, as I know I am not the only person who might need this sort of things. Inside the store’s floor and warehouse proper is where most of the games were being exhibited. I milled around, elbowing my way past throngs of people, as most of the cabinets or laptop setups were close together. I regret to say that I did not play most of the games that were at the exhibition, but one that caught my eye was the Choosatron by Jerry Belich. The idea of a game being a Choose Your Adventure register printer was really unassuming and creative to me. I picked a story that revolved around the machine’s assurance that I was dead. Quietly, and with satisfaction at the simplicity of it, I folded up the tape of my story and put it in my pocket. I still have it. Most of my time was spent watching other people play the games and that was fine enough for me. Something about games is intensely private for me, whether it is putting quarters into a machine no one is playing or sitting at my computer fiddling around in Diablo 3. The idea of people leaning over, waiting their turn and watching me gave me the creeps and reinforced this idea in myself that I’m still terrible at video games. However, this was mostly my own anxiety talking. No one was being rude or aggressive at any point during the event. Dying was a mirthful moment, and messing up got the usual face-palms and backslaps from friends. I got to watch one of the game’s creators (I believe) even cheering on participants who made a point of knocking over tables in Tango in Paradise Simulator (Andy Saia) by chanting, “TABLE TABLE TABLE!” loudly. While I was a touch sad I didn’t get to play Max Gentleman (Hats Productions) or Tango in Paradise, Crypt of the Necrodancer (Brace Yourself Games), getting to be a part of the overall experience was worth it to me. Everything about the space and experience was rewarding and gave me some part of myself back that I had lost along the way in the past month. As Gita and I took a car back to her apartment, both of us remarked how positive the day had been. 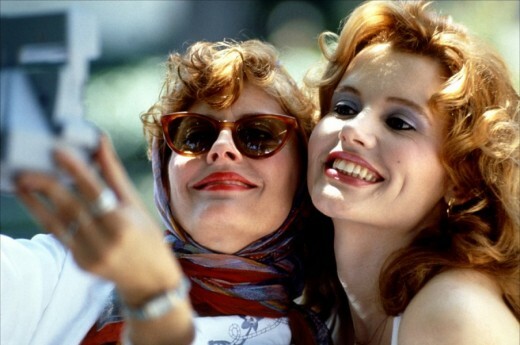 Both of us had felt a need for something like that and we had gotten it in spades. It was an enriching event that felt like the way games should be: fun and for everyone. Everyone from adults to kids had a good time, including two little girls that had just come from tap recitals and someone’s grandmother watching the Joust. It was a renewing Saturday. It would have been even if in the wee hours of the night, Zoe Quinn hadn’t revealed that this feverish nightmare had been online misogynist brigades actually conspiring. It washed away a lot of the perpetually sour, negative feelings I’d had over the past couple of weeks and gave me at least one bright spot amid all of the rubbish. In the larger aspect, it felt like this is how I imagined things. I know it’s a little high-minded to wish for a utopian world where gaming could be for everyone, without harassment or guile or oppression, but for a few hours in a warehouse, maybe it was. I’ve started to notice in games journalism that as more and more conversations are had about sexism in the gaming community, the whittling away of what caused it keeps coming up. Game developers blurting out unvarnished opinions about women in video games and women characters are passed off as mere good-natured ignorance because it’s not seen as volatile misogyny. The problem with this is that is doing nothing but lessening the impact of calling it sexist. Intent and feelings do not matter whether a game developer is hurling slurs at women or merely making a statement that misses the mark. Sexism is sexism and we need to address that fact. I wrote up a Storify regarding why I tackled this topic and it includes a link to the latest article that falls into that rhetorical trap. This is something we really need to stop doing.